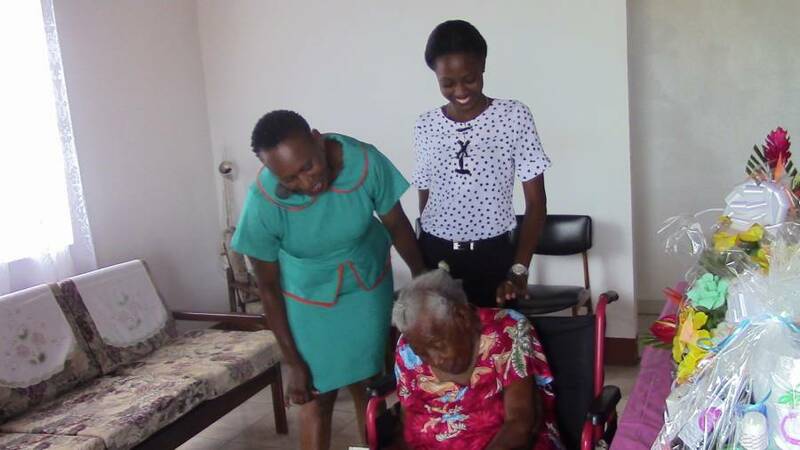 On Wednesday 24 May, the Ministry of Social Development and Housing acknowledged the birthday Agatha Christopher, affectionately called “Mama”. At the age of 105, she is the oldest woman alive on the island of Grenada. According to Delroy Louison, Public Relations officer of the ministry, 8 other centenarians have been celebrated by the ministry to date. Agatha Christopher was born on 24 May 1912 and grew up in the Historic Parish, St Patrick. She is well versed in Dutch, which she learnt during her stay in Aruba in her early days. During her lifetime, she gave birth to 11 children, with 5 girls and 2 boys still alive. Miss Christopher boasts of a clean bill of health and one of her caretakers, Andra Blake says it’s not difficult caring for Grenada’s oldest woman. The Desk of the Elderly within the ministry visited her home, which is adjacent to the Botanical Gardens in St George on Wednesday morning to celebrate her milestone, and presented a token on behalf of the ministry.